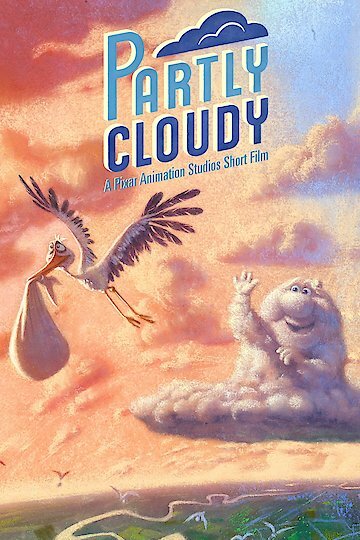 "Charming and cute and clever"
This animated film is about a sky full of cute puffy clouds that create babies of all kinds to give to the stork. There is a not so positive cloud, Gus, who makes not so nice babies to send to their parents. The poor stork who is assigned to Gus is on the receiving end of his anger. Fearing for his life Peck the stork escapes and flies away, never to return. Creating a thunderstorm, Gus starts crying. Equipped with a football and helmet Speck returns, changing him for the better. Partly Cloudy is currently available to watch and stream, buy on demand at Vudu, Google Play, iTunes, YouTube VOD online.